Intricately hand woven in finest quality silk on cotton. 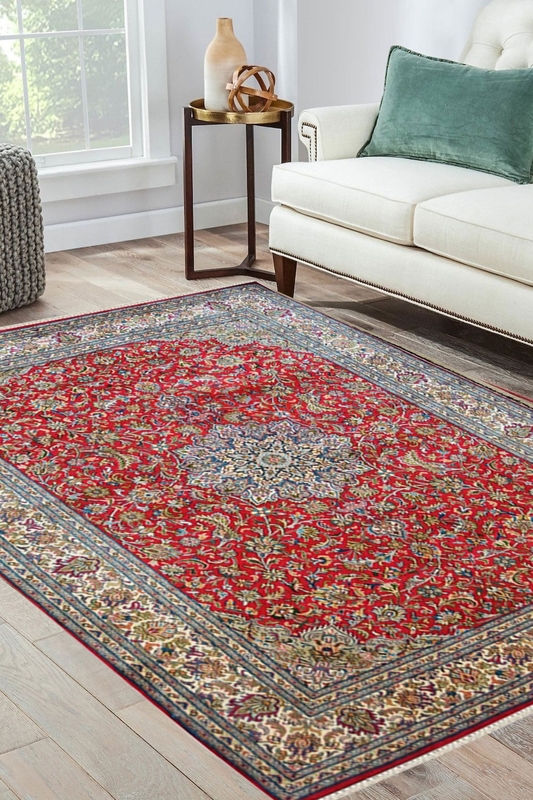 Due to its intricate craftsmanship and vibrant colors, this Rouge Kashan will add finesse to any space it is placed in. It has taken almost 5 months to weave this exclusive rug. - 100% Handmade in finest quality silk, this Kashan beauty is one of its kind. - Due to its bright colors, this rug would add vibrancy to any space it is placed in. - This rug is Handmade in a cotton base and has pure Silk on top. - Primary colors are soothing red with tinges of ivory all over the rug. - The border is intricately woven in curvilinear pattern. - The design has been originated in a town called Kashan and is a one of a kind product. - It is hard to get a similar product of such fine quality. - Our recommendation is to place this rug as a featured one or as wall hanging. - Extra care and maintenance is required due to its suppleness and soft texture.